We're happy to announce that the new module for Responsive Joomla has been released - SJ Content Responsive Listing. With dividing 3 clear and special parts of layout - top, content and bottom - will bring to you many options for showing categories of articles. 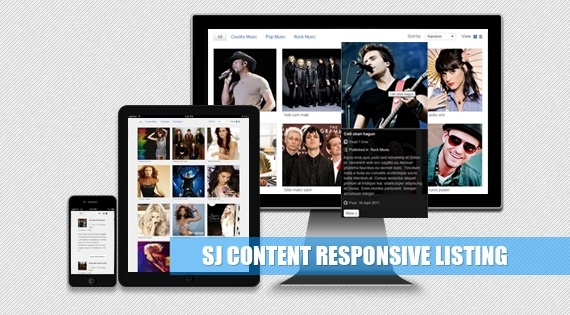 SJ Content Responsive Listing is used for showing all articles in categories that are placed on the top. The audiences can optimize to sort articles or change the viewing of articles (grid/list view). Especially, in the administrator, you can choose the number of columns that is suitable with various dimensions of screen for presenting. And when you hover on each image, this seems to be the same with hovering on the images if you search by Google. Do you like it? We think with these features, you shouldn't let slip the module. Let view our Demo to fell more!